When I informed Srila Govinda Maharaj that I was going to Caracas for the festival of the anniversary of the inauguration of Parama Karuna Sri Sri Nitai Gaurachandra, and I had been invited to Quito by Gaura Hari Prabhu and his wife, Lalita Priya Devi Dasi, Srila Maharaj told me, "If you can go to Caracas, that is perfect, and if you can also go to Ecuador, that is more perfect." I was in Quito for six day. Some of the photos are in our ashram there and some of the photos are in the restaurant of Gaura Hari Prabhu and Lalita Priya Devi Dasi in downtown Quito. There are also photos of the fire sacrifice and initiations. All together, thirteen persons received first initiation, and three men and one lady were given brahman initiation. Quitois at an altitude of 2,800 meters (more than 8,400 feet). It is in the Andes mountains, and of major cities in Latin America is the second highest city, being second only to La Paz, Bolivia. The devotees were very affectionate, and I was attended very well by Yugala Kishor Prabhu and the other devotees who live in the ashram. The preaching programs were well attended, and I am fortunate to have had the opportunity to visit there. 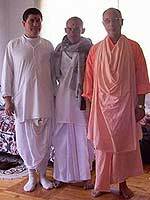 Of course, I was always encouraged to visit Quito by Raja Ram Prabhu and his wife, Revati Devi Dasi, who have been in Soquel for almost six years, but who are always helping to look after the devotional programs in their native place of Quito.